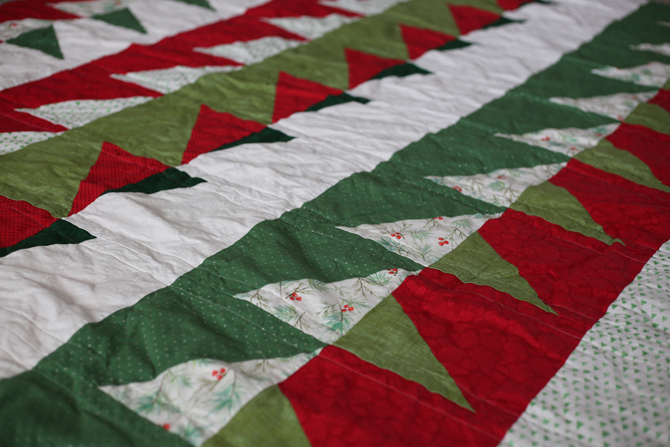 Last December, as we were decking the halls, I thought to myself- I really want to make a Christmas quilt. But December isn't exactly the best time to attack a craft of that magnitude so I (reluctantly) put that idea in the "someday" pile and moved on my merry way. Sometime last Summer the thought came back around, and I was so proud of myself for thinking of it early this time, for getting ahead of things! But then...I forgot to actually do anything about it, (it's kind of hard to get in the yuletide spirit when it's more of a tidepool season) so the idea accidentally found its way back to the "someday" pile. And then...it was November. And this idea suddenly sprang back into my head. 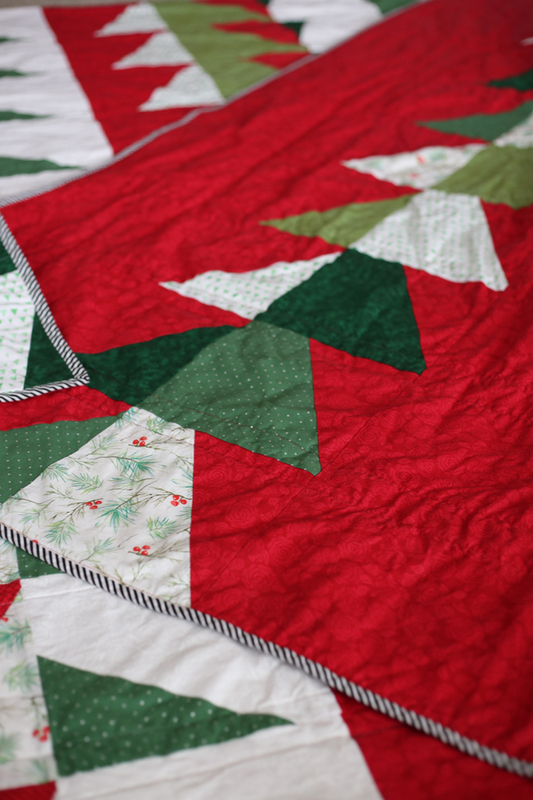 I had to have a Christmas quilt. And not someday. THIS day. THIS season. THIS Christmas. 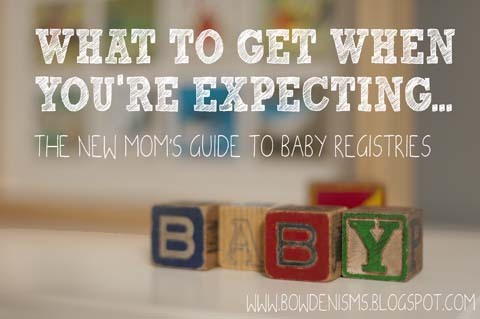 I knew that the timing was awful- the last thing we need right now is one more thing to do (or one more mess covering our dining table) but there was no reasoning with me this time around (not even me reasoning with myself). 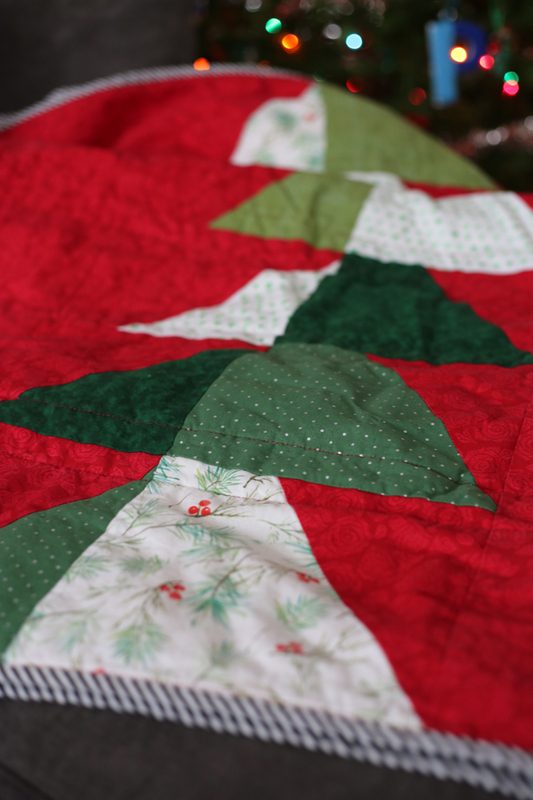 This was the year of the Christmas quilt. No matter how little sense that seemed to make. So I poked around my Pinterest boards of old ideas, trying to find something magical to make this dream a reality, but I just wasn't finding anything I loved. 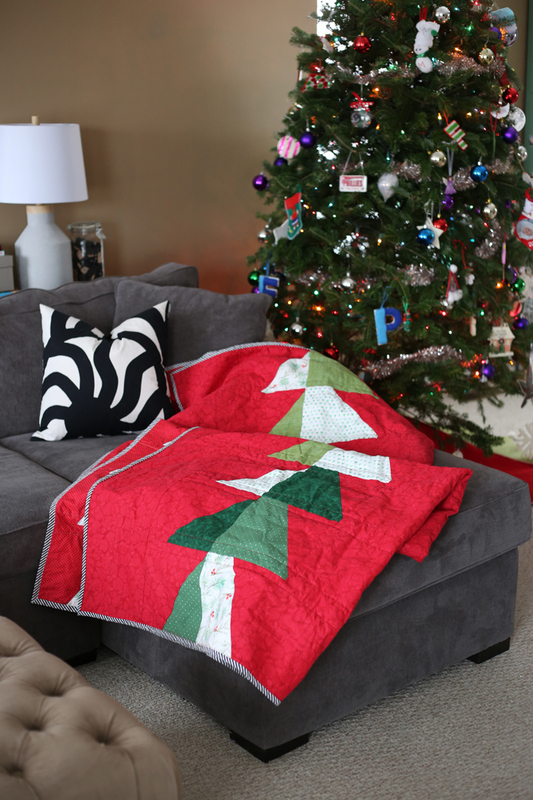 The bayside quilt, by Suzy Quilts. It was modern. It was beautiful. It abstractly looked like Christmas trees. The only problem? The pattern wasn't available yet. Suzy was going to release it on Cyber Monday (the day after Thanksgiving weekend), which at the time was still a week away. 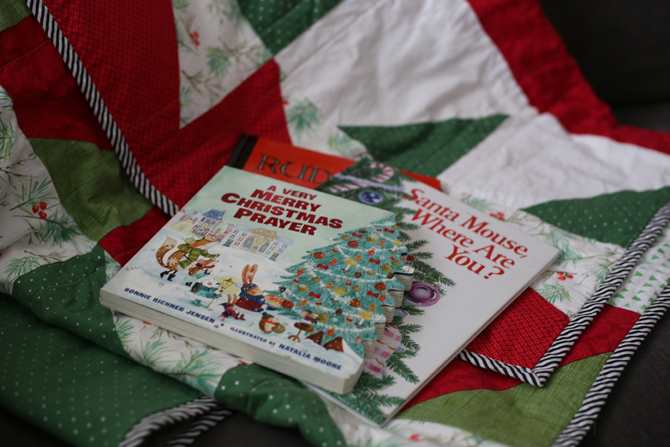 Making a quilt in time for Christmas was crazy, but I knew it would be impossible if I didn't take advantage of some sewing time over the long holiday weekend. 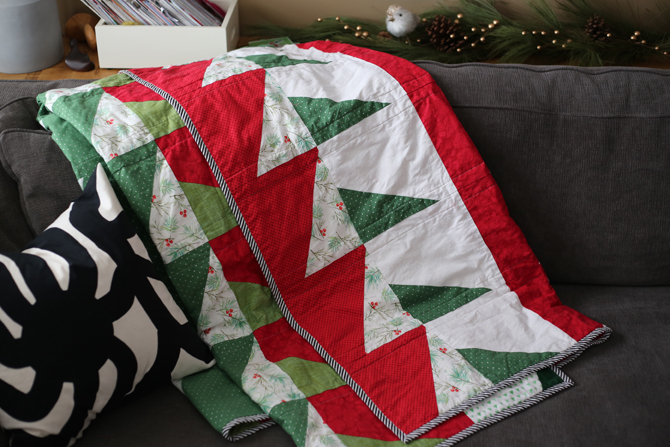 So I took a chance, and sent her a direct message telling her how lovely her quilt was, and how desperately I wanted one of my very own, and asked if mayyyyyyybe, just mayyyyyyybe she'd be willing to let me buy an advanced copy of the pattern? I laid in my bed, read her message back to me and I cried. I cried because we were going to have a Christmas quilt. Which means we were going to have a Christmas. Now, I know I have a flair for the dramatic from time to time...but I think recently at least, I come by it honestly. Because to be real, the last two months have been rough. Like...really rough. I am so so so very tired. Physically, yes, but also mentally and emotionally and spiritually. I have too many conflicting and complicated feelings about the whole thing to pour it all out right here right now, but the part that matters at this point is that I was just feeling hopeless. And helpless. I couldn't make everything fun. I couldn't make everything good. I couldn't make everything, anything. But I could make a quilt. 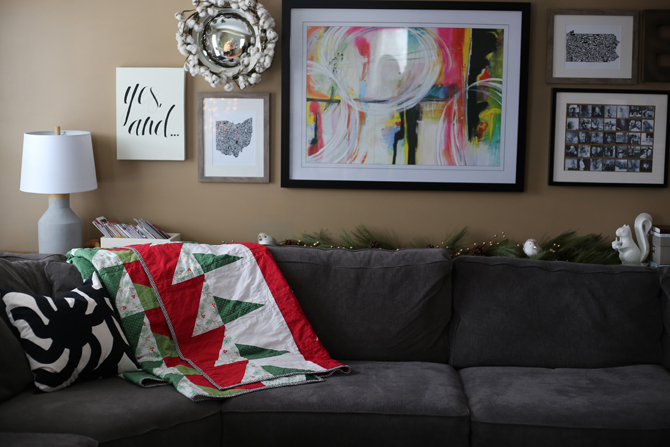 And I thought to myself, that maybe if I made a big enough quilt; a beautiful enough quilt; a cozy enough quilt...maybe I could tuck my whole family underneath it and we'd be ok. Maybe my kids would have a physical representation of how much I adore them. Maybe I'd be forgiven for the impatience, selfishness, and lack of compassion that's pouring out of me in ways that make me ashamed of who I am. Maybe this could be my atonement for getting us all into a giant mess that I can barely see out of. Maybe I could pour my effort and my emotions into making something beautiful in the midst of the murkiness, and we could have a soft place to land. A safe place to snuggle. 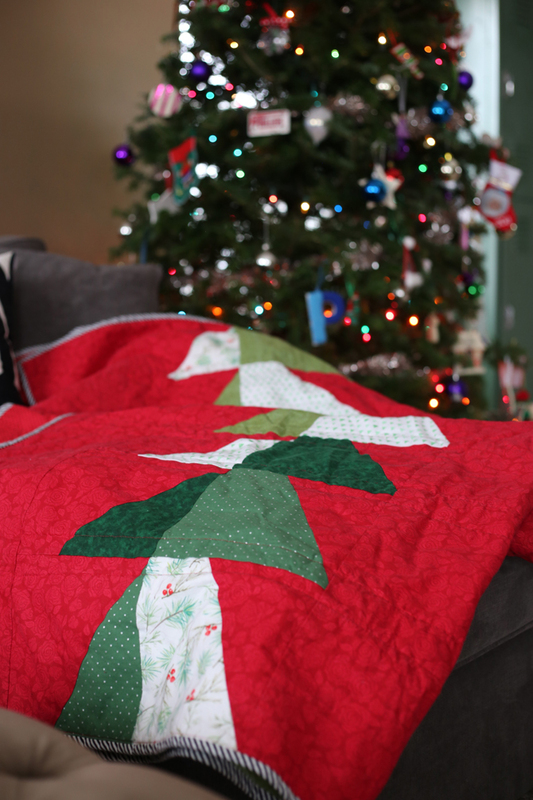 A patchwork version of comfort and joy. 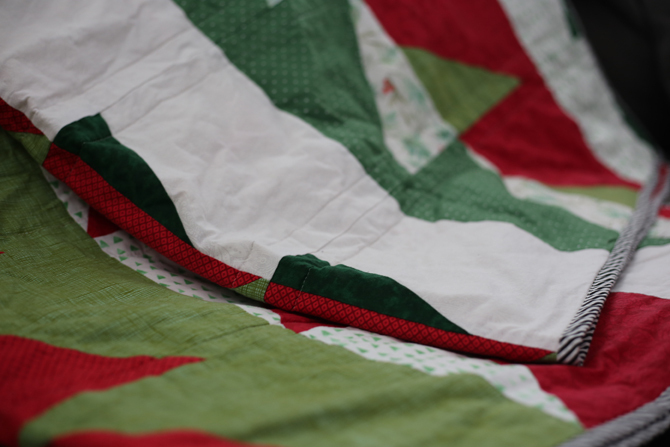 And so this quilt became my labor of love, and honestly, my coping mechanism. In foster care, in parenting, in life there is so much that it is out of our control. And I HATE being out of control. There are so many things I just....can't. I needed some things that I can. Well...I can buy adorable prints. And lay out something inspiring. And measure. And cut. And measure. And cut. And sew. And sew. And sew. So that's what I did. Every night after bedtime I lugged out my supplies, popped in my headphones, and I worked. I worked on something concrete, and tangible, and lovely. 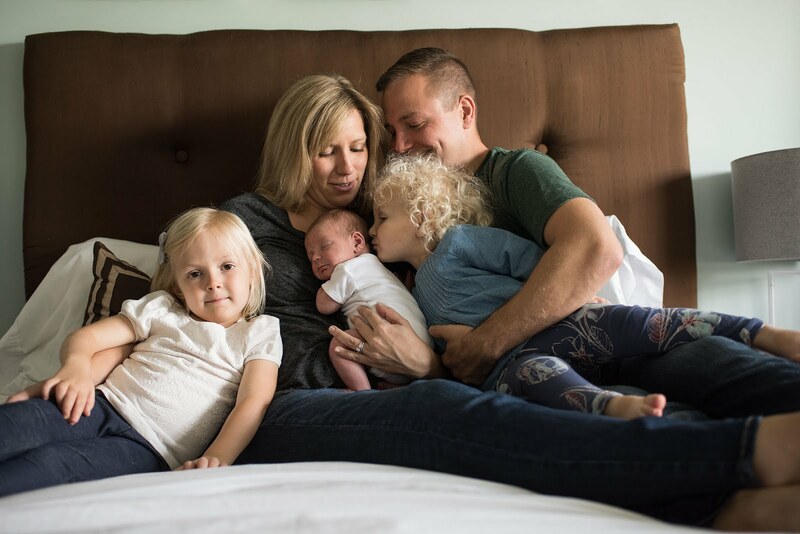 I listened to parenting podcasts, I prayed as I pressed, and I tried to lose myself in something I could feel good at. Something that that make sense. That has a start and a finish. Process, progress, right angles, and complimentary colors. Something that keeps my hands busy, and my mind from wandering into darkness. To compensate and to escape. I want to eat my feelings, buy my feelings, and craft my feelings. I want to shower my kids with every good thing I can find, to make up for all the terrible things they've seen and are dealing with. So many of which are beyond my control, but even scarier, so many of which are my fault. I want to drown myself in every good thing I can find, to distract from the overwhelming fear, failure, guilt, shame, worry, sadness and doubt. I may not literally self-medicate, but I understand the desire people have to escape the harder parts of life. To throw yourself into whatever seems to work, whatever feels better, whatever is easier than facing another day full of uncertainty and exhaustion. So my quilt is complicated. It's something I'm extremely proud of, and also desperately in need of. I had to make this...while I wonder if we're going to make it. And now it's complete- edges squared, stray threads snipped off, ready for cuddles, and forts, and messes, and movies, and books, and tears, and....Christmas. Well, I'm not quite ready for Christmas, and I'm no where near complete. My edges are raw, and I've got loose threads everywhere, threatening to unravel at any moment. But now I do have a big fluffy reminder that there are things I am good at, traditions I'm building, and memories that will matter. This quilt isn't the point. It's a byproduct of a much bigger work that is being done in our lives right now...a work that is far from over. Right now, this quilt is a thing that I did to help me feel centered, and productive, and maybe even just a little bit merry. Soon it'll be a thing that I use to cover my people in a love I'm not even sure I fully have. Later it'll be something we bring back out as a reminder of where we've been, and a hope for where we're headed. If you're here for the quilt, and got sucked into the dramatics, my apologies. I'm a quilter, yes, but I'm also a sharer, (and an oversharer), so you may come for the fabric but you'll leave with a story. Quilt pattern: Suzy Quilts Bayside. It's so affordable, and so easy to follow. 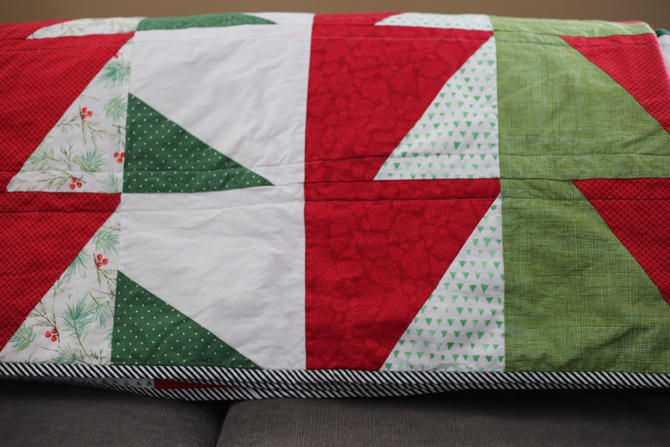 I've never used a quilt pattern before, so this was a fun kind of "reverse" challenge, to not do it all myself this time. I also followed her video tutorials for template cutting, and chain-piecing which helped the process go more smoothly. I did change things up a bit because I wanted to use more fabrics than the pattern called for, so I ended up having to do a lot more thinking, adjusting, and surprisingly difficult math-ing, to get everything to work. I also insisted upon doing something fun on the back (All of my quilts have had a pieced back of some kind. I just can't bring myself to do one plain backer. It's contrary to my more is more ethos!) so I had to figure that out on the fly as well. Fabric: Joann. I didn't want to belabor this prework of it all...I just wanted to GET MOVING, so I took Piper with me to Joann one day and just blitzed through the holiday aisles, grabbing anything that looked like it could work. I eventually narrowed it down to the 8 I loved best that I thought would work together well. I actually rushed the process a little, buying fabric before I had the pattern, so I was taking wild guesses on how much I needed. That proved to be a mistake (duh!) but a fixable one, though it did require spending another hour at the Joann's cutting counter returning some of my pieces, digging up the matching bolts of fabric and re-buying appropriate amounts. Batting: Warm and Natural (I hate that brand name so so much. But I love the batting). Walking foot: After spending farrrrrrr too long doing my first row of quilting I sprung for walking foot and oooooh (feed) doggies it was helpful. (I posted a tale of confusion and woe in my local quilters' guild Facebook group, and they recommended I get one). It's stuff like this that reminds me I have NO clue what I'm doing. 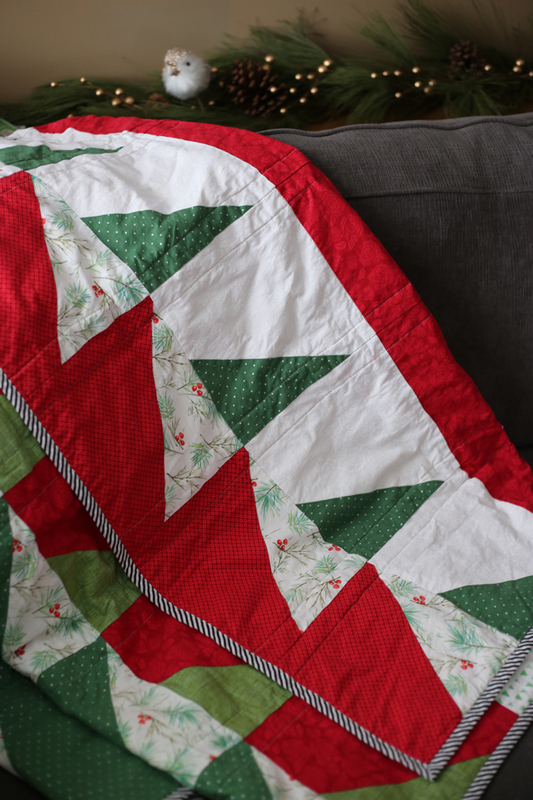 I approach quilting a whole lot like I approach life- get in super deep super fast, basically wing it all, learn everything the hard way... Oh, but wait. Now we're wading back into metaphors and melancholy self-reflection. I better sign off and make time for the really good stuff...because this quilt was made to be loved- and I know just the people to do it. 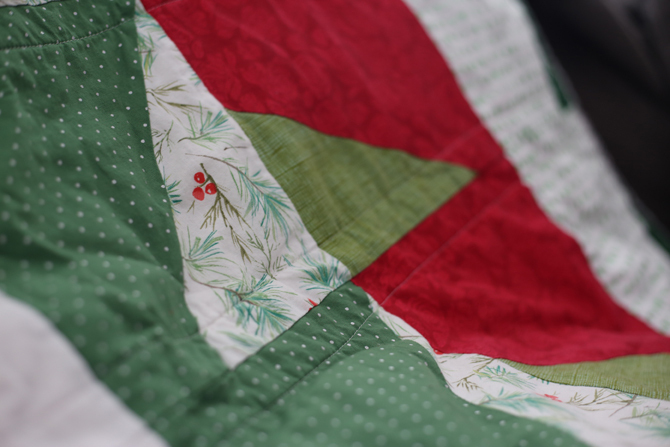 For more quilt love- poke around the blog, or instagram. It's beautiful Courtney! Cherished Treasure!